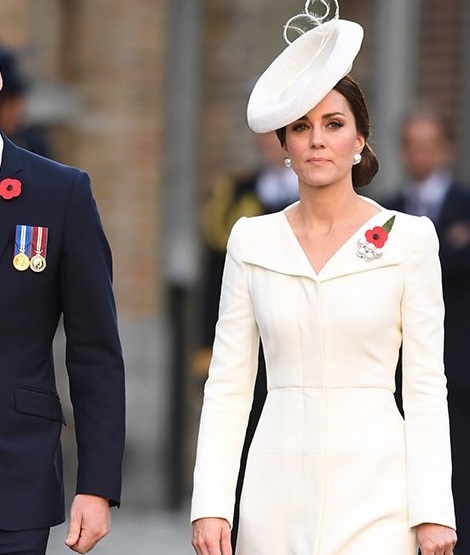 The Duke and Duchess of Cambridge today attended the Last Post ceremony at the Commonwealth War Graves Commission – CWGC Ypres (Menin Gate) Memorial in Belgium. 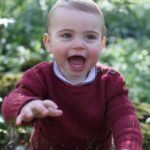 They are in Belgium along with Prince Charles of Wales to commemorate the Centenary of Passchendaele – The Third Battle of Ypres on 30 and 31 July. Fought between 31 July and 10 November 1917, the Third Battle of Ypres, or Passchendaele as it has become known, was one of the bloodiest battles on the Western Front. By its end, an estimated 500,000 men on both sides had been killed, wounded, were captured or missing. The Menin Gate Memorial to the Missing is a war memorial in Ypres, Belgium, dedicated to the British and Commonwealth soldiers who were killed in the Ypres Salient of World War I and whose graves are unknown, located at the eastern exit of the town was designed by Sir Reginald Blomfield and built and maintained by the Commonwealth War Graves Commission, the Menin Gate Memorial was unveiled on 24 July 1927. Every night at 8.00pm (20:00 hours) a moving ceremony takes place under the Menin Gate in Ieper – Ypres. Tonight over 200 descendants whose ancestors are named on the Gate and representatives from nations who fought on the Salient joined British and Belgian royals. The UK ambassador to Belgium, Alison Rose, accompanies Kate and William as they walk to the Menin Gate Memorial to the Missing. Duke and Duchess of Cambridge were joined by Belgian King Philippe and Queen Mathilde to Mark the Centenary of Passchendaele. More than 54000 Poppies drop from the roof of Menin Gate in honour of the fallen, one for every name on the Menin Gate. Today, the Menin Gate records almost 54,000 names of the men who did not return home; the missing with no known grave. Members of our families; our regiments; our nations; all sacrificed everything for the lives we live today. During the First World War Britain and Belgium stood shoulder to shoulder. One hundred years on, we still stand together, gathering as so many do every night, in remembrance of that sacrifice. A view of the Menin Gate where more than 54000 names of brave soldiers are engraved. Prince William put a protective hand on his wife’s back while leaving the Menin Gate. 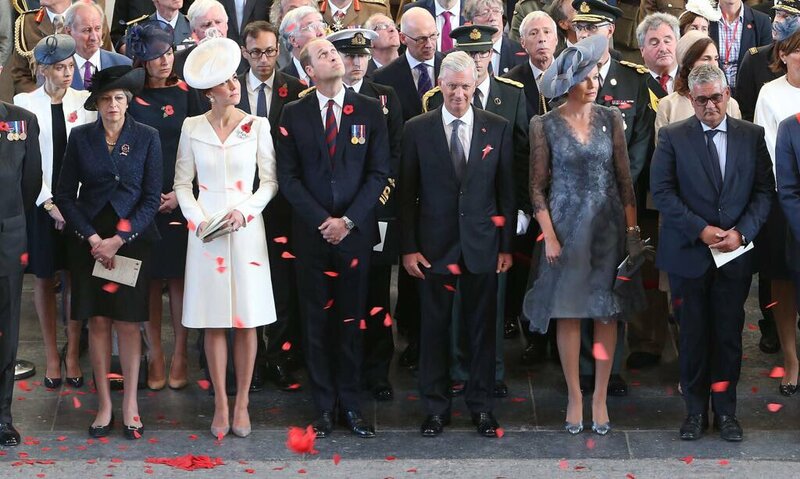 After the Last Post ceremony, The Duke, Duchess along with King Philippe and Queen Mathilde arrived for the second portion of the commemoration. Everyone walked to the Ypres market square for a dramatic presentation commemorating the Battle. Cloth Hall, Ypres, is backdrop for tonight’s moving tribute to those who served in Belgium in World War I.
William and Kate at Cloth Hall. A view of the stage where emotionally powerful and enticing performances were given by various artists. Highlights of the evening included performances by Dame Helen Mirren, the cast of The Wipers Times introduced by Ian Hislop, a tri-service orchestra and the voices of the National Youth Choir of Scotland. The Duke and Duchess got the chance to meet some of the descendants of those who served on the Ypres Salient from 1914-1918. 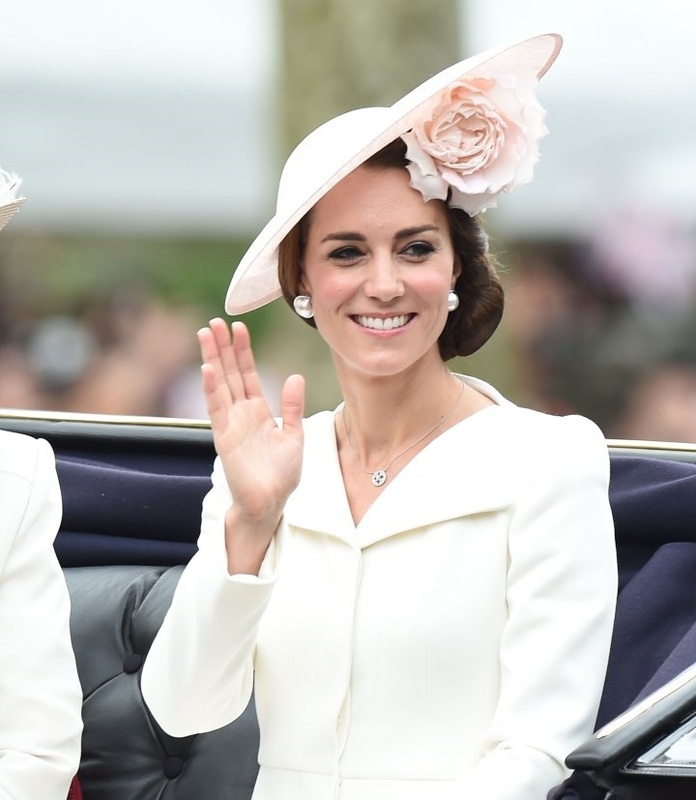 For the event It seems Duchess of Cambridge brought the bests of Trooping the Colour together. 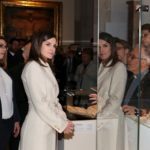 Kate looked regal in the Alexander McQueen cream coatdress first worn for Princess Charlotte’s christening two years ago. The fit-and-flare design features wide winged lapels and a fitted, tailored bodice. 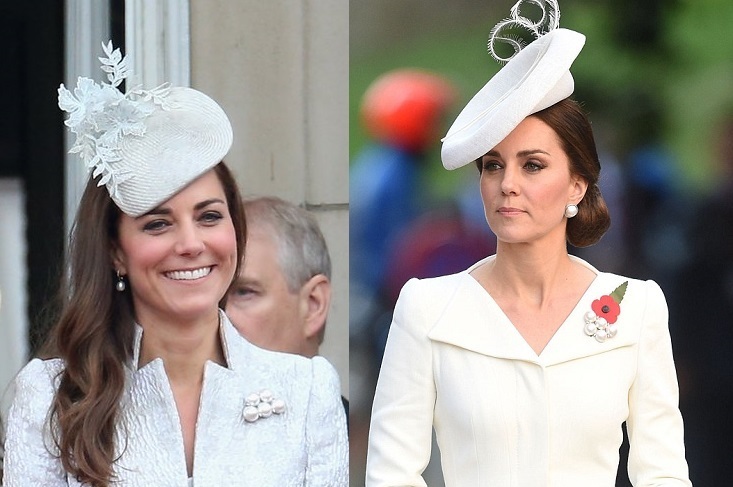 Kate also wear the same dress at Trooping the Colour in 2016. 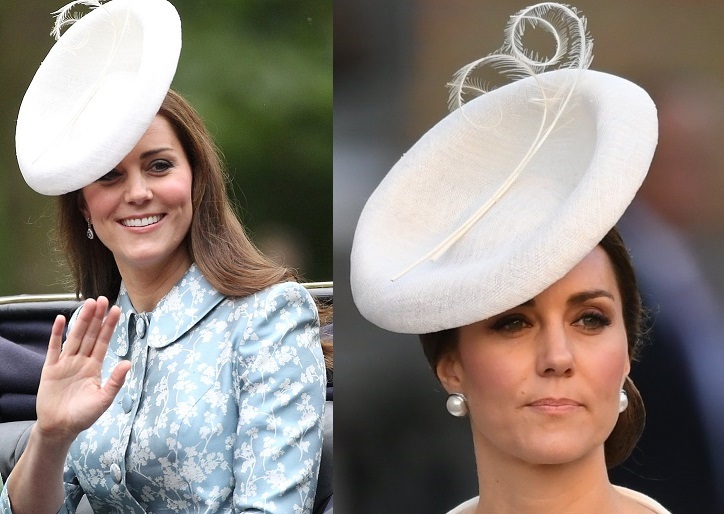 Duchess paired her outfit with Lock and Co Hatters white Marisabel hat that we have seen during Trooping the Colour in 2015. The hat was designed by Sylvia Fletcher, the head designer of the label. The piece is crafted of sinamay, a straw frequently used for hats. Kate carried her new Anne Grand-Clement clutch that we recently saw during Industrial reception in Berlin. 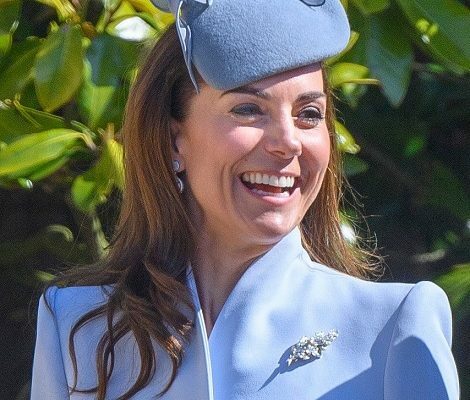 The Duchess accessorised the outfit with her pearl brooch. We saw the brooch at Trooping the Colour in 2014. 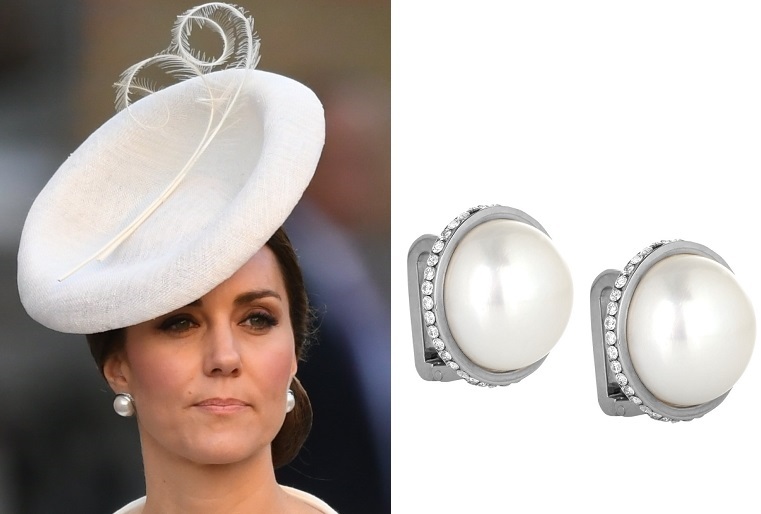 Kate’s Balenciaga earrings, that were first noted at Trooping the Colour 2016, complemented the today’s look. Eugenia silver-tone, faux pearl and crystal ear cuffs crafted in Italy from silver-tone brass, showcase oversized faux pearls surrounded by glittering crystals. Today Duchess debuted a new pair of pumps. The label of the heels is still unknown. 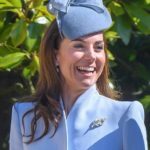 The Royal Couple was also joined by Vice-Admiral Timothy Laurence and British Prime Minister Theresa May. 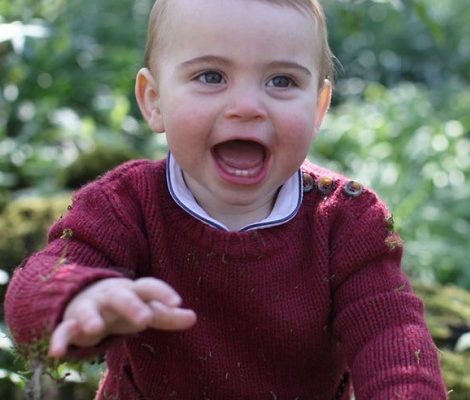 Tomorrow they will join Prince Charles for the second day of the commemoration.